Maj. Pete Stambersky, Contracting Division deputy chief and Capt. Marc Orozco, engineer, explained to the students their job with the LA District. 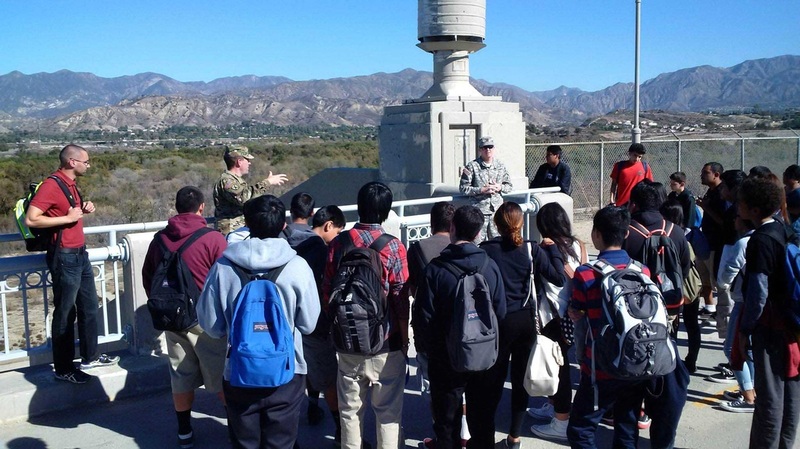 The more than 100 students from Birmingham Community Charter High School and Los Angeles River School, a pilot high school of the Sotomayor Learning Academies, trekked around the dam to learn about the multitude of career disciplines it takes to support flood risk management infrastructure. "This dam is a vital piece in the prevention of flood damage for Los Angeles," said Maj. Pete Stambersky, Contracting Division deputy chief. "It is our pleasure to show you how it works and what it takes to keep it operational." Dam tenders, engineers, contractors, biologists, ecologists, journalists, and their leadership spoke about the function of the dam and the associated programs that keep it operating, while keeping an eye on the environment of the area. The students were not only able to see the structure's spillway, inlet works and gate controls, but they walked around a marsh area in the basin to learn about native wildlife. "Because we're a Linked Learning school, we have opportunities to connect with the community," said Claudia Chiriboga, English teacher at LA River School. "This opportunity seemed to really fit in with our environmental science theme, because of the whole water conservation aspect that the students will discuss in their science classes." Linked Learning integrates rigorous academics with career-based learning and real world workplace experiences in fields such as engineering, health care and performing arts. During a presentation of the natural resources of the basin, the students were led to a shady, hidden riparian pond. One of the students found a green praying mantis which she hosted on her arm for the remainder of the tour. "The students were polite and interested," said Corps Ecologist Carvel Bass. "They snapped many cellphone selfies at the 'secret' pond and learned about hydrologic cycle, water conservation and local effects from drought and the potential El Nino." Hansen Dam is a flood risk reduction project located near the northern edge of the San Fernando Valley on Tujunga Wash, about one mile below the confluence of the Big Tujunga and Little Tujunga washes, and about four miles southeast of the town of San Fernando.